Holy Week is widely celebrated in Bogota with religious patrons worshiping at Monserrate, praying to the Santuario de Guadalupe or following the long standing tradition of visiting seven religious monuments. There isn’t a shortage of religious festivities going on in Bogota during Holy Week, but the most widely populous activities include worshiping at Monserrate, praying to Santurario de Guadalupe and following the old tradition of trekking to seven religious monuments. Monserrate, Bogota’s 10,000 feet high mountain boasting a pristine, white church, and wonderfully elaborate stations of the cross, hosts some 130,000 worshipers during Holy Week. There’s a steady flow of visitors throughout Holy Week with the most on Good Friday and Easter. The church is a major mecca for pilgrims due to the statue of Senor Caldo, to which many miracles have been attributed. 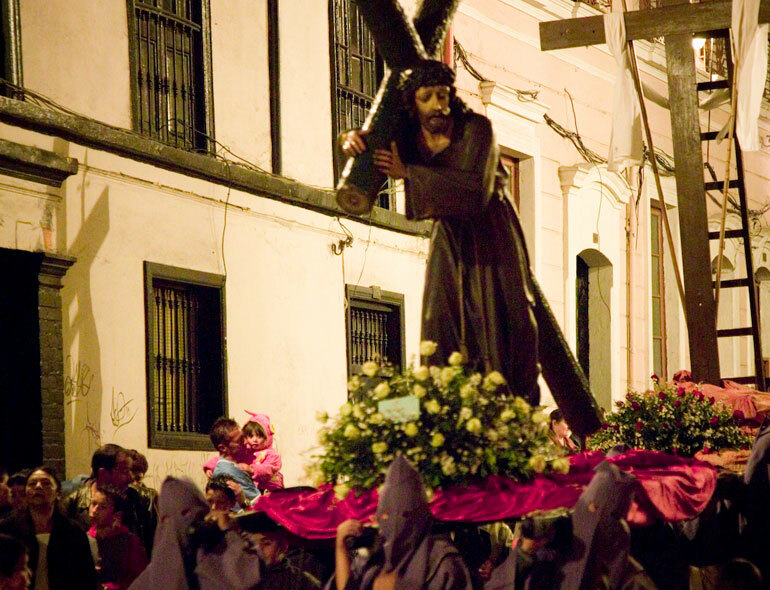 Furthermore, especially during Holy Week, many believers forgo the easy way up the mountain via the funicular or cable railway and choose to walk or crawl up the steep mountain. They believe that their act will reward them with granted wishes or healing. Scaling up the mountain takes anywhere hours from one to three as the poorly paved trails become extremely crowded. During Holy Week there is a maximum capacity of a whopping 17,444 people on the trail at a time. There are restrictions in place during the festivities to make sure the rigorous journey is safe for all and without expectation children under 3 feet, women in advanced stages of pregnancy, disabled adults, persons older than 75 years old and pets are unable to make the hiking trek. Regardless of how one chooses to reach the top, they will be engulfed in religious tranquility with the opportunity to attend mass at the church, visit the stations of the cross or simply reflect while looking out upon the massive city. People reside on the top of the hill for many hours and if they stay long enough they’ll be able to experience the church at night, which is illuminated by colored lights making for quite a spectacular sight. The hill is open Holy Thursday from 5AM to 9:30PM. The round trip ticket price from 5AM to 6PM is approximately $5 and from 6PM to 9:30PM, the rate drops to approximately $3.94. On Good Friday, the hill is open 4AM to 5:30PM. The early bird round trip ticket price is approximately $2.81, but rises to about $5 from 8AM to 5PM. On Easter Sunday, hours are 5AM to 6PM and the round trip ticket price is $5. From Monserrate, if you look to the South, you will see the Santurario of Guadalupe, a 45 foot statue of the immaculate conception dedicated to the Vigin of Guadalupe. This work of art created by Gustavo Arcila Uribe is also highly trafficked during Holy Week and is another pilgrimage destination serving as a place of prayer and healing. A long standing tradition in Bogota is to visit seven religious monuments or churches. The pilgrimage is done by Catholic believers to remember the journey that Jesus made during his crucifixion process. Throughout Holy Week, you will see packs of people sauntering from one church to the next to stop in and receive blessing or say a prayer. Each church honors Jesus by organizing, decorating and presenting a room to him which is open to the public throughout the day until the wee hours of the night. Shrines that are recommended for visiting during Easter are the following. The churches are spread throughout the entire city, with the Shrine of Holy Infant Jesus considered one of the most important places of pilgrimage and prayer in Bogota.